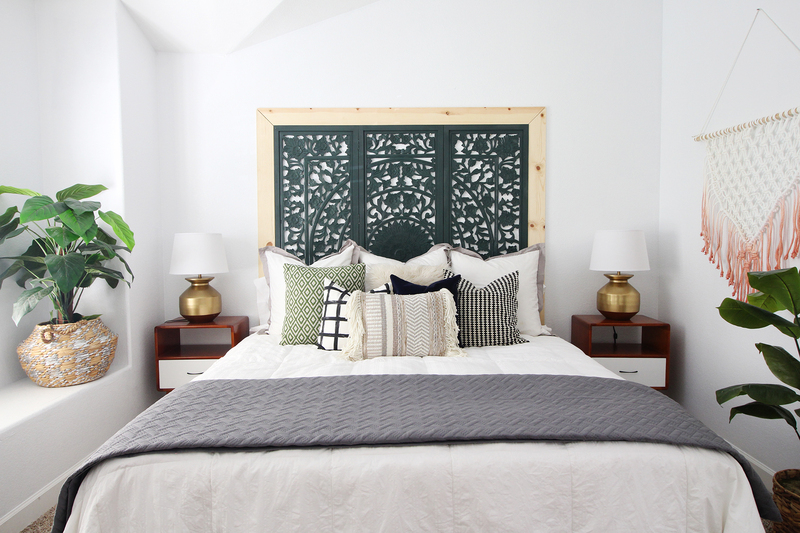 I am so excited about this project! Many of you saw our sneak peek on Instagram stories and you were excited about it too which makes us EVEN MORE excited! We’ve partnered with Fiskars in celebration of the 50th anniversary of their iconic Orange-handled Scissors! 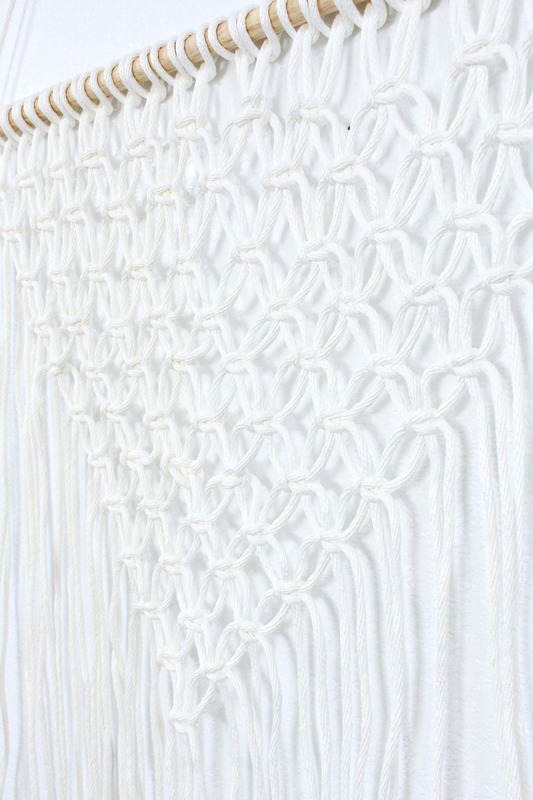 The color of the scissors inspired us to create a bit of a throwback project to the popular 1960’s trend, macramé! And, Fiskars Orange-handled Scissors were also a product of the 1960’s! We are so excited to celebrate 50 years with them! 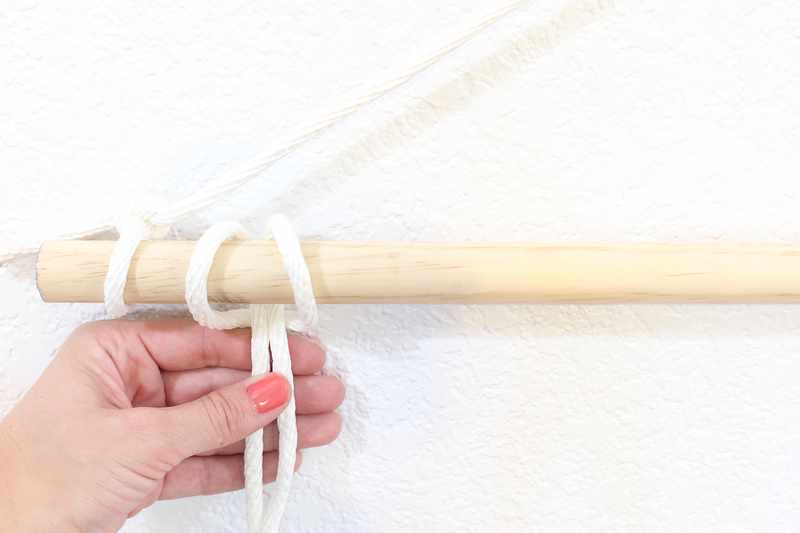 First, cut a piece of rope about 1-2′ longer than your dowel and tie a knot on each end. 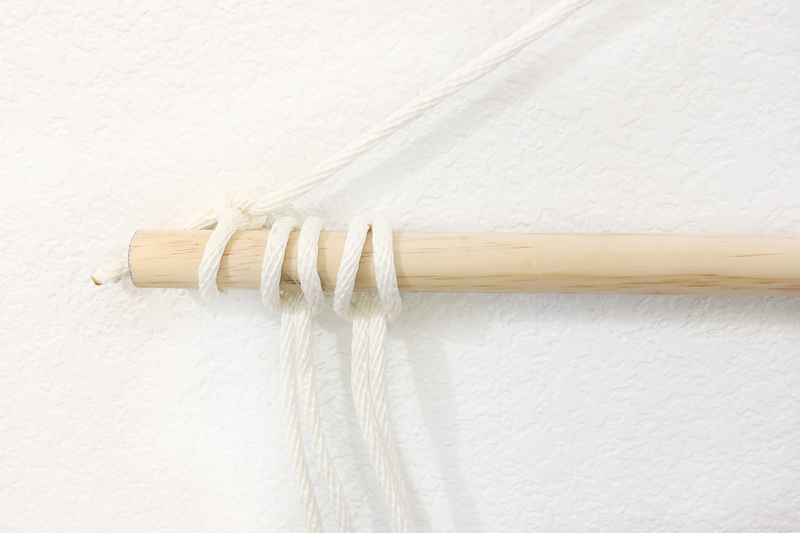 This will be your string to hang your piece when you’re done. 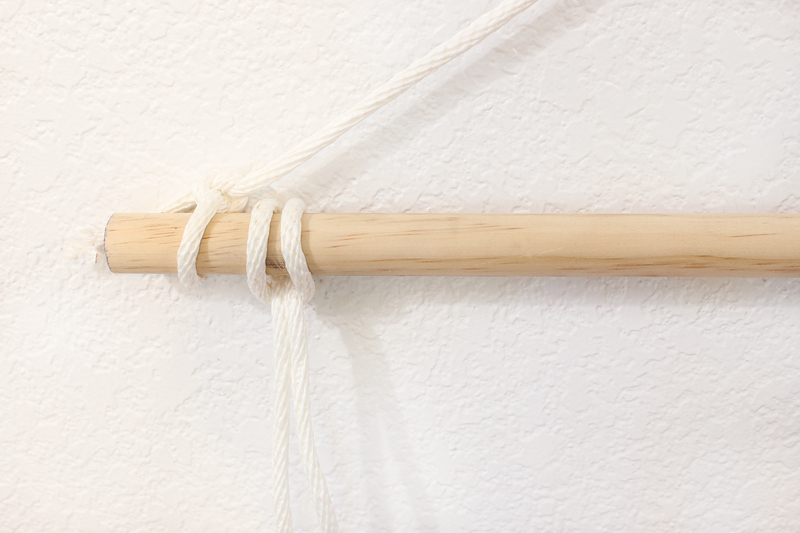 Next, cut 24 pieces of rope at 120″ or so. 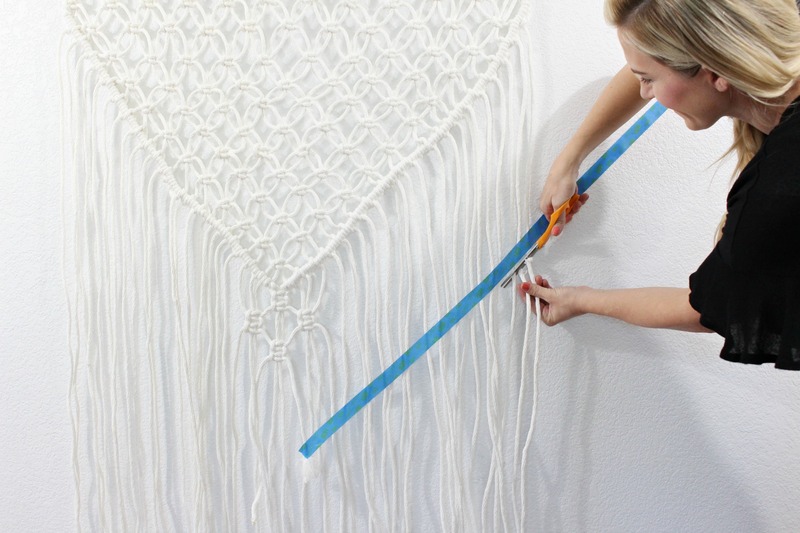 This length will depend on the overall size of your piece. I did 2 1/2 arm spans since I did not need a precise measurement. 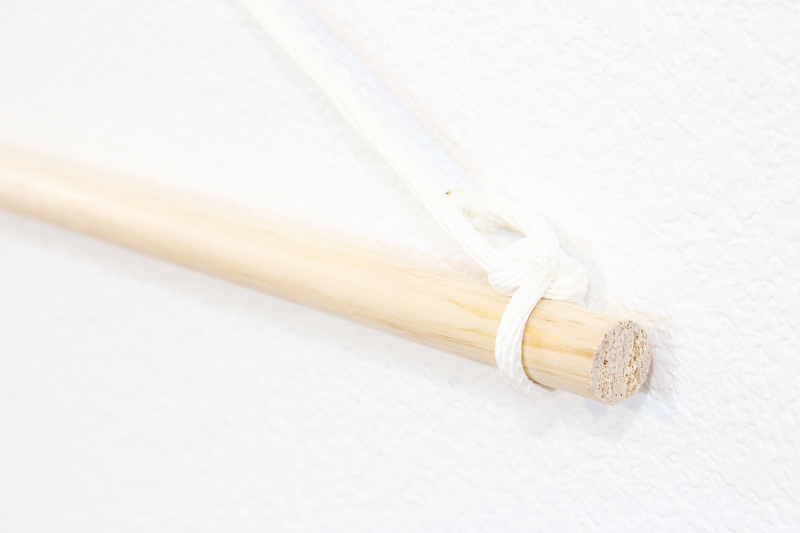 Next, tie 24 Lark’s Head Knots across your dowel. 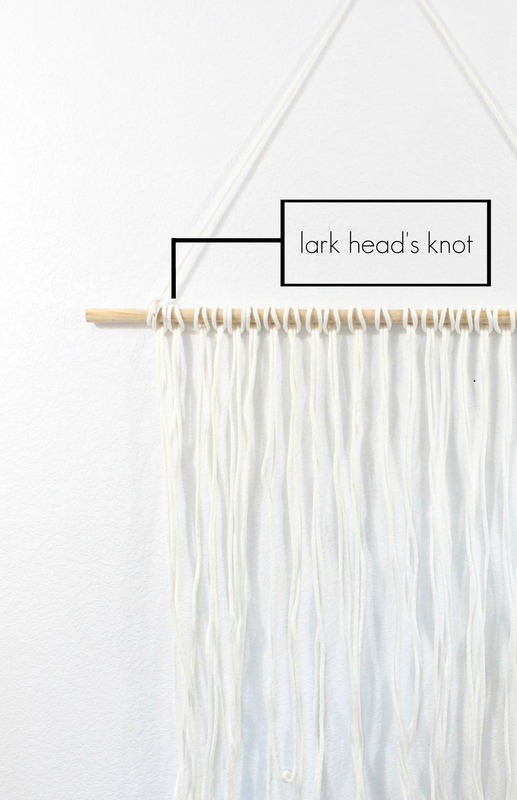 If you’re not familiar with the Lark’s Head Knot, you can watch my video here. 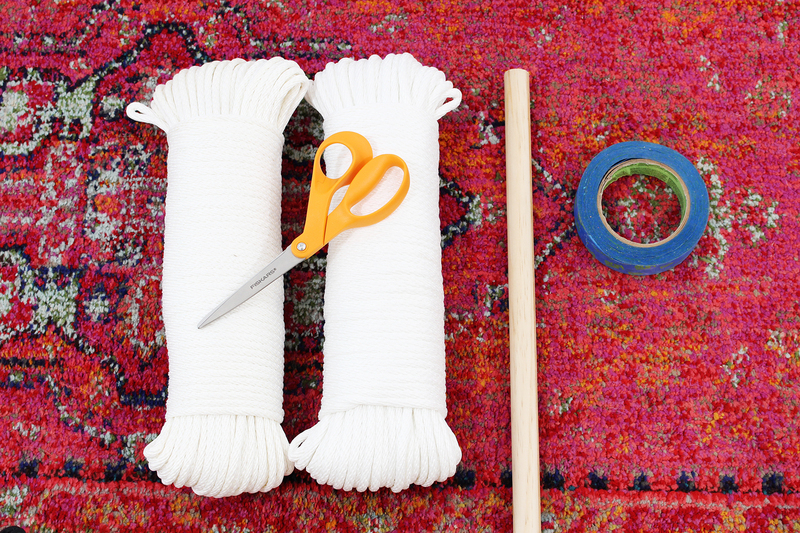 Next, you will begin tying 12 square knots across the entire first row. 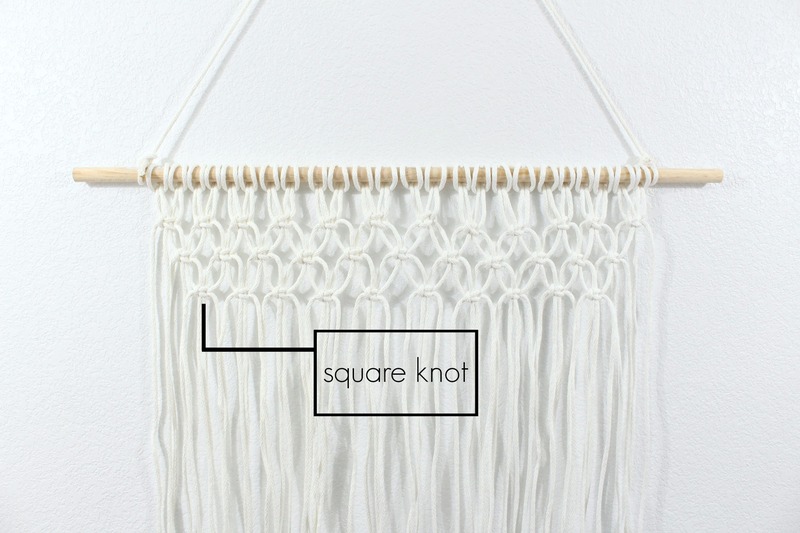 Square knots are 4-strand knots. 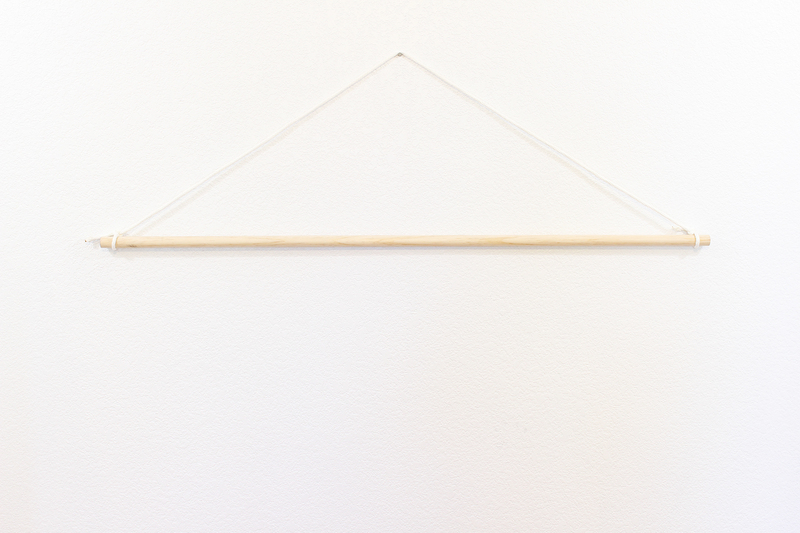 Start on one end of your piece and work your way across horizontally. 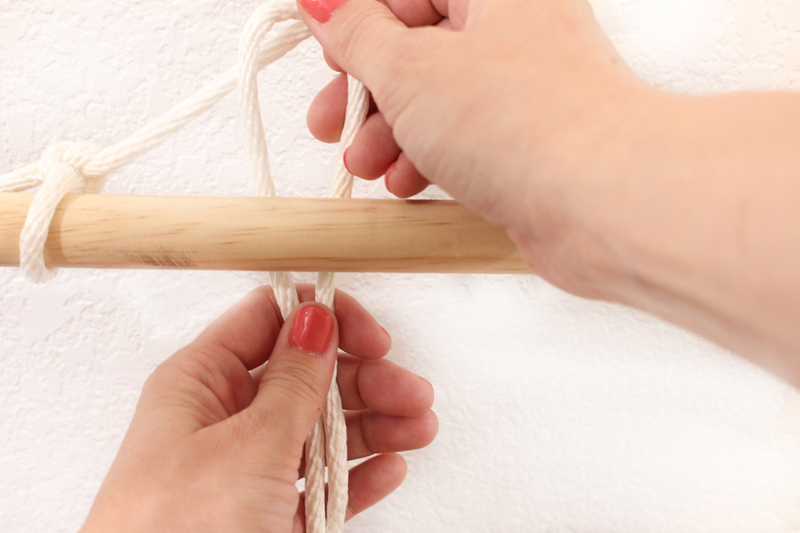 For the second row, you will skip the first two strands and start on the 3rd strand in and tie 11 square knots. 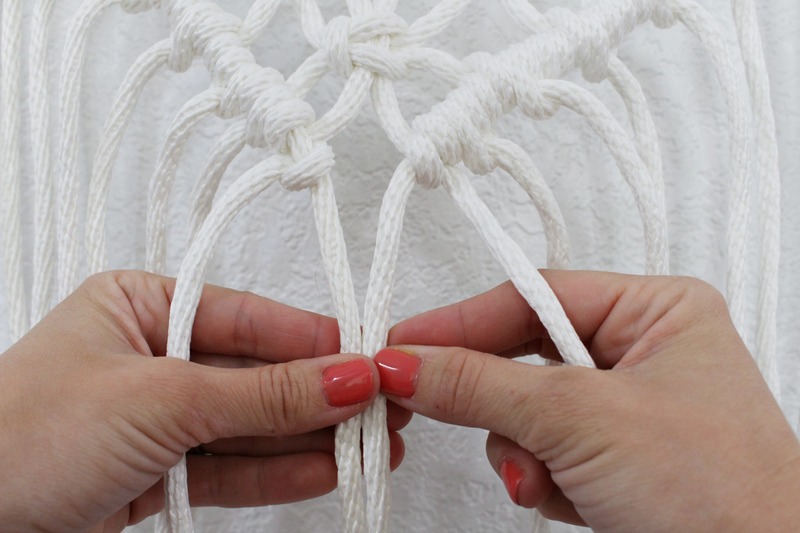 Continue this process all the way down until you have one square knot at the center, creating an overall triangular or “V” shape. 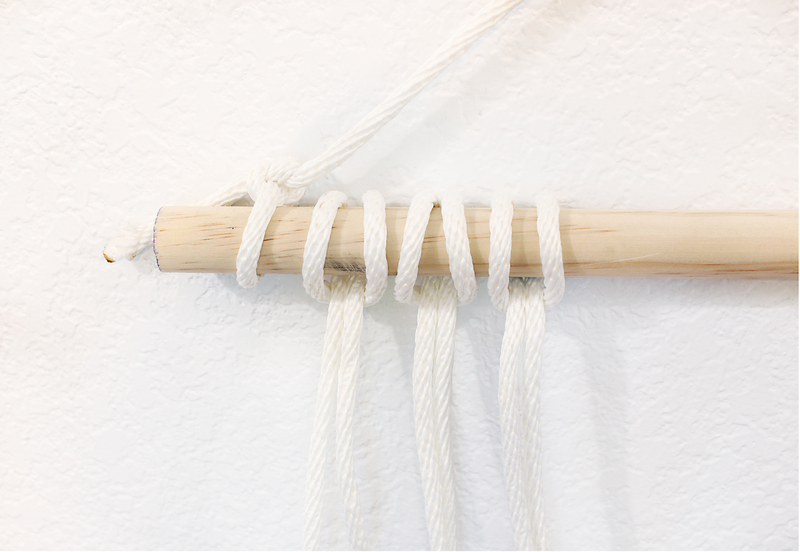 Once you have all of your rows of square knots tied, you will begin a series diagonal double half hitch knots down the left and right sides of your triangle or “V”. 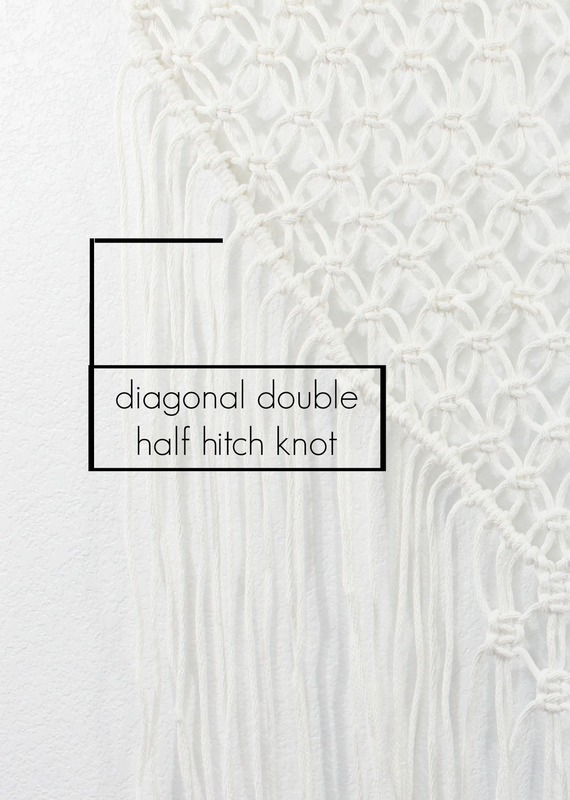 The double half hitch knots create a border and trim out the triangle or “V” shape of your piece. 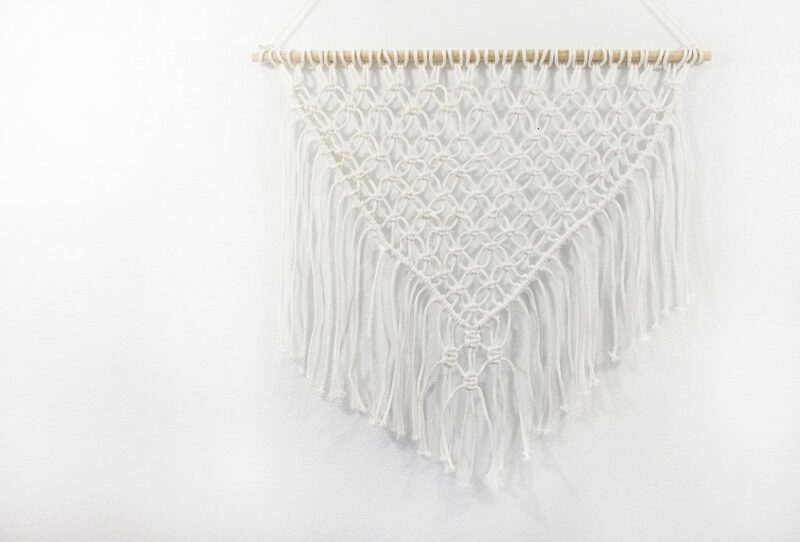 You should have a few feet of rope left creating a fringe look at the bottom of your piece. 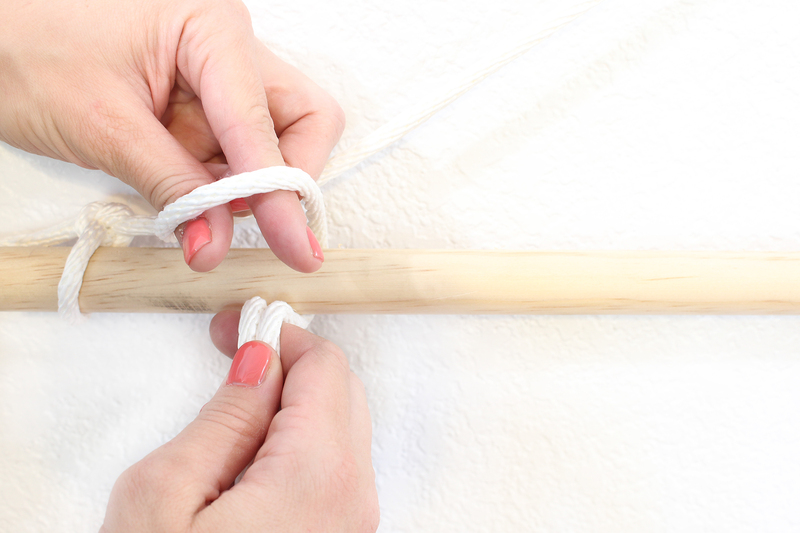 To secure and join the double half hitch knots, tie another square knot at the bottom of your “V”. 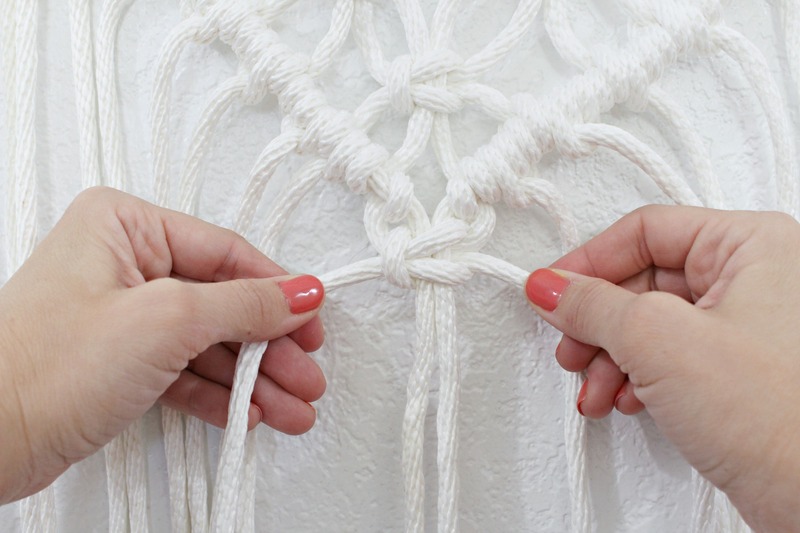 Optional: Gather 4 strands of your fringe in various areas and tie a few more square knots for added detail. 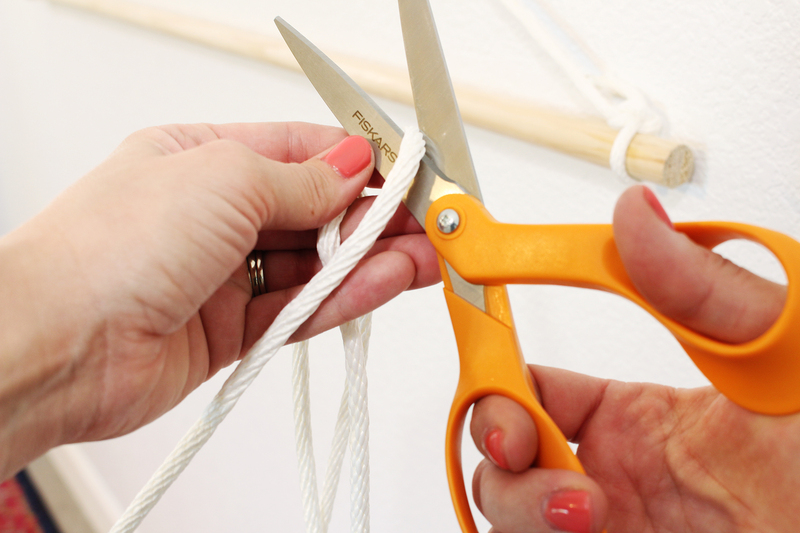 Finally, using tape as a guide diagonally, trim your fringe to your desired length using your Fiskars Original Orange-handled Scissors. There is no right or wrong way to do this! Fiskars Orange-handled Scissors are our FAVORITE scissors to use while crafting and we are excited to be celebrating their 50th anniversary! 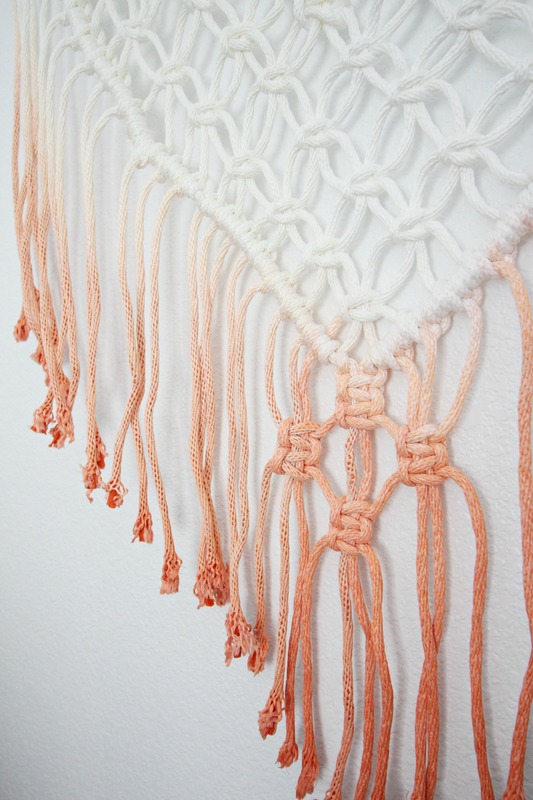 The Orange-handled Scissors inspired me to dye the fringe of my macramé piece orange! 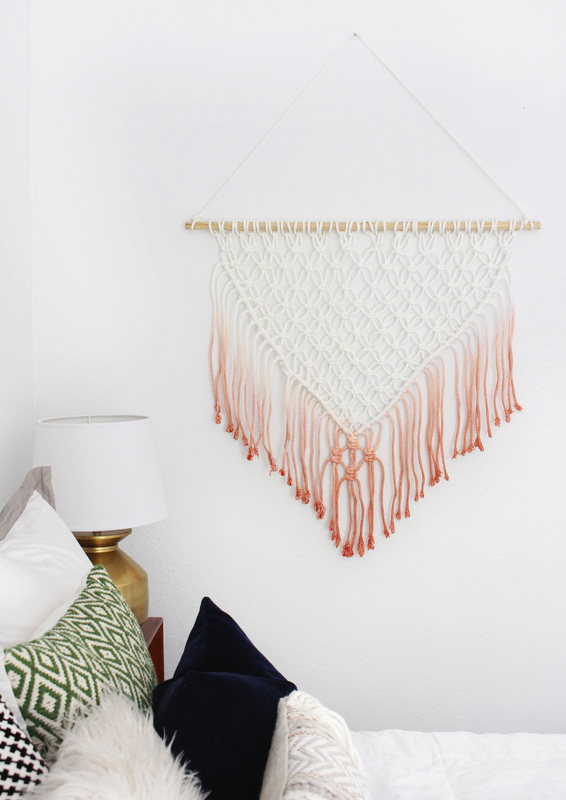 You may know that I don’t typically choose orange for an accent color for my projects but this orange dye was absolutely perfect for this boho style project and for the space I was creating my macramé wall hanging for, our guest room! 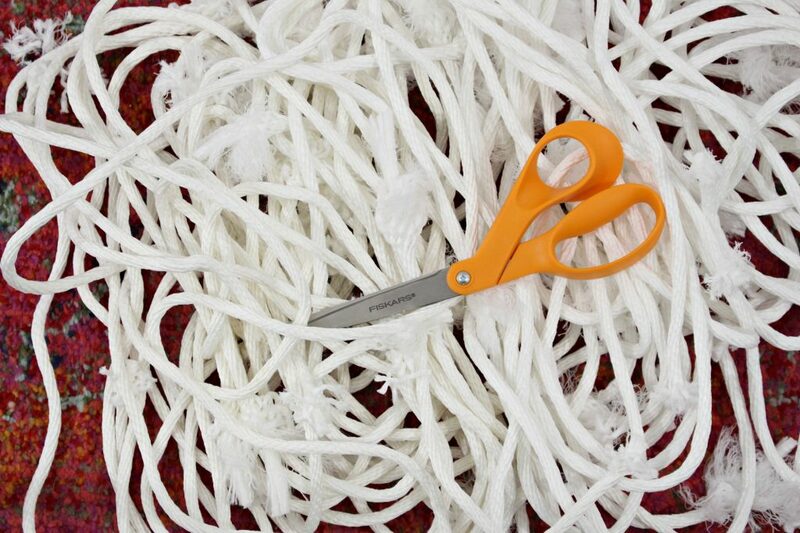 Fun fact: The color of the scissors actually came about when leftover plastic was used from juicer production. And they were the world’s first plastic handled scissors. The amazing design of Fiskars Orange-handled Scissors made them a worldwide favorite and Fiskars has sold over 1 billion pairs since their introduction back in 1967. 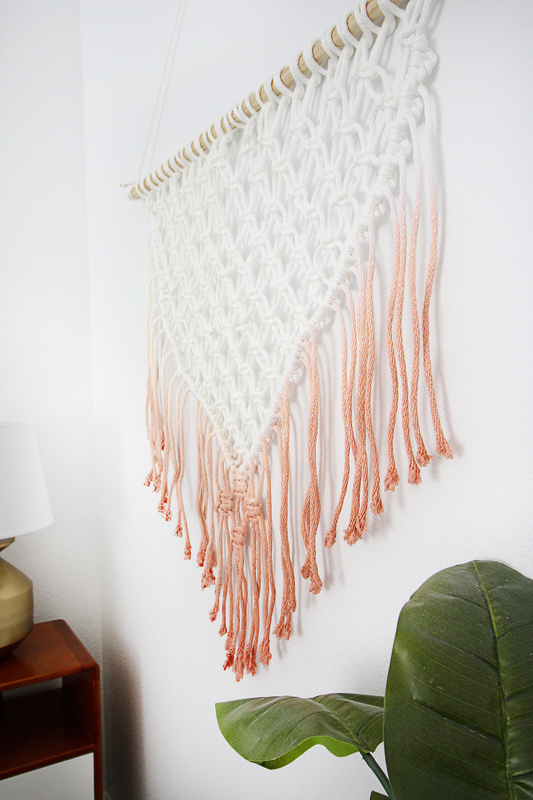 I used a bottle of orange fabric dye (color: tangerine) and a splash of brown (color: cocoa) dye to dip-dye the fringe of my piece. 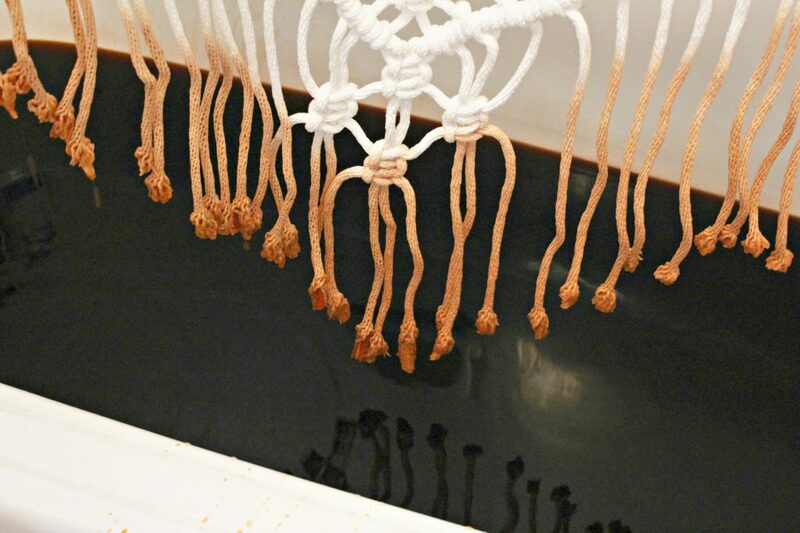 I followed the directions on the dye except instead of rinsing the dye out of the rope, I hung it to dry and let the excess drip off. I did this to avoid bleeding on the piece where I didn’t want it dyed and to maintain the rich orange color. 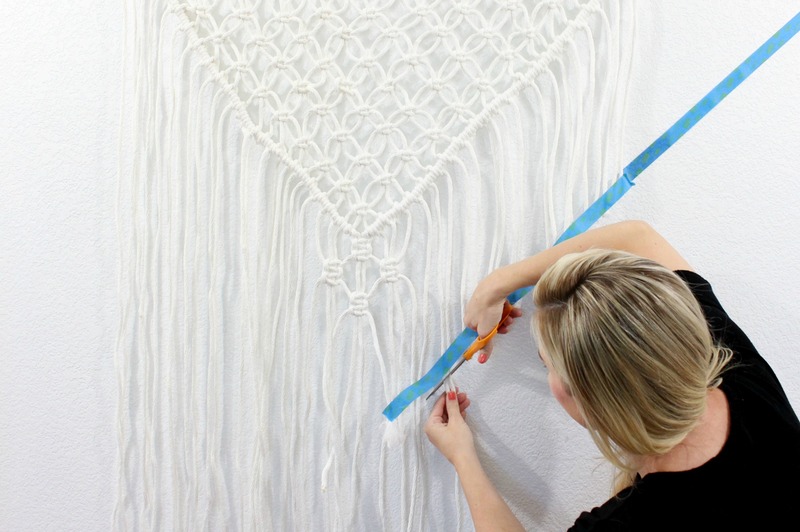 Once the piece is completely dry, you are ready to hang it up! 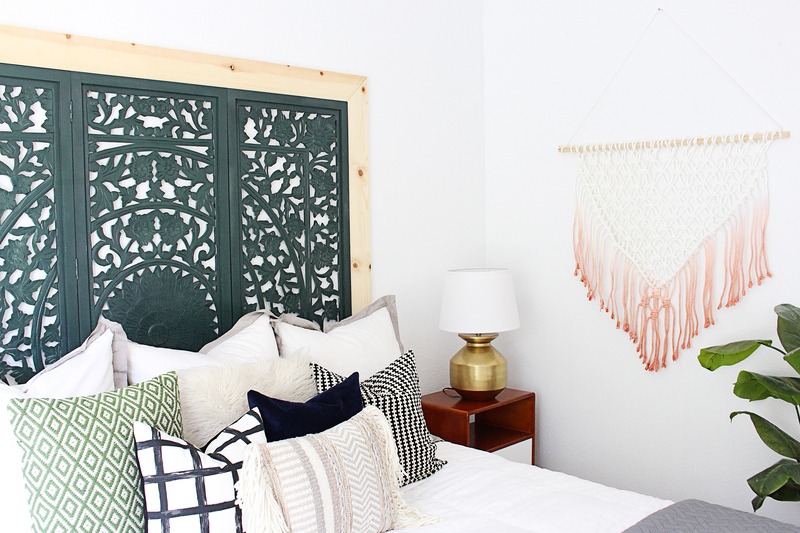 The guest room is 90% finished and I can’t wait to share the entire space with you! Be sure to check out Fiskars on Facebook, Twitter, Pinterest, Instagram and YouTube for more projects and inspiration and see how they are celebrating the 50th anniversary of the iconic Orange-handled Scissors! 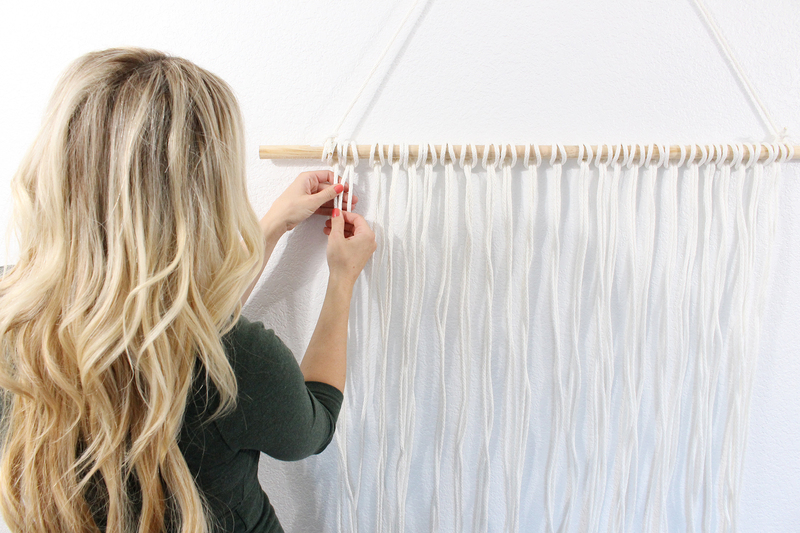 What size of cotton cord did you use?